It is twenty years since landscape action group, Common Ground, set up their innovative project Confluence. Located on the Dorset Stour, the ideas for stimulating local connectiveness to the river flowed nationwide. Confluence was intended to bring the river alive, to connect to local people, and explore and celebrate their local knowledge of the river and its place – geographically and culturally. Music was the medium to engage with people and Common Ground ran workshops, commissioned new music, and held concerts to celebrate the river and bring people together. “Even in England, where we had learnt to share the power of the stream with wild creatures and plants, leating it to drive mills, diverting it to flood meadows, damming it to pacify and to please, some of our activities are having profound implications. Through two centuries of industrialisation we have turned our back on the city river; in only five decades, intensifying farming practices have filled the country river with chemicals; engineering has straightened the meanders, rendering the river more, not less, unpredictable. Fashions in fear and development, have conspired to push running water away from our everyday experience, increasingly reducing streams to ditches and finally to culverts… We are united in our need for water, but are increasingly divided by its scarcity. At the very moment when we need the closeness of water to feed our humanity and imagination, we seem to be denied literal contact, and have lost sight and sound of its magic”. This message continues to resonate two decades later with concerns about pollution, abstraction, flooding and silting of stream beds from soil run-off. When Common Ground started its project there was widespread concern about the selling-off of water companies into the private sector. As a Committee member of the Consumer Council for Water, I met with water companies in this privatised era. Why would Chinese investors buy one of our water companies? “Because we want to spread risk” they replied. “Your water companies are a safe investment, a low rate of return but a secure investment as part of our total portfolio”. Somehow the selling off of our water, the lifeblood of our landscape, as well as the resource we need to drink and bathe in, sits uncomfortably. 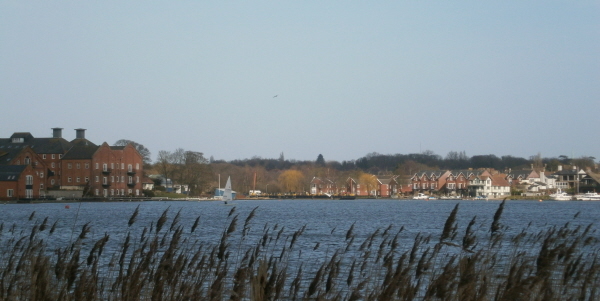 Waveney & Blyth Arts has its own confluence – its meeting of rivers and location of place specific creative activities. On 25th April, we will be focusing down on the river landscape. How did rivers shape the landscape? How did humans respond to that shaping and reshaping? How did we settle and use the rivers as generations dwelt alongside them. The Waveney and Blyth rivers have been, and still are, both a real and metaphorical channel of communication and commerce that draw people together. In celebration of our rivers, in anticipation of building connectiveness between science and art, landscape managers and creative people, and in recognition of the work of Common Ground, Waveney & Blyth Arts encourages you to join us where the river runs through to Oulton Broad. Our one day event on 25th April takes place at the Ivy House Country Hotel. Dr Jos Smith, from the University of East Anglia, will be reflecting, twenty years on, on the influence of Confluence. In his recent book, The New Nature Writing: Rethinking the Literature of Place, Dr Smith explores the link between literature and environmental activism. He takes the archived newsletters of Common Ground and explores the contribution of the Confluence project which ran for three years from 1998. He suggests Alice Oswald’s long poem Dart was influenced by Confluence. And of course, Roger Deakin, a Director of Common Ground, produced his own book, Waterlog. We are fortunate that Karen Wimhurst, composer and musician who worked on the Confluence project, as well as Waveney & Blyth Arts own recent performance piece, Translated by Reeds, has agreed to come up from Dorset and talk about her musical response to the river. The New Nature Writing: Rethinking the Literature of Place. Jos Smith. Bloomsbury. 2017.